We almost recovered, now we'll have three days not leaving home, we'll just chill and try to finally get healthy. Thank you very much! Happy New Year to you! Choinka ma potem rosnąć na balkonie? Pewnie pójdzie do rodziców na działkę, a na razie postoi na balkonie. Dziś rano i mnie za oknem też jest śnieg, i słoneczko, i nie ma wiatru, yikes! *^v^* Aż się chce iść na spacer! Śnieg już jest :) Wszystkiego dobrego! 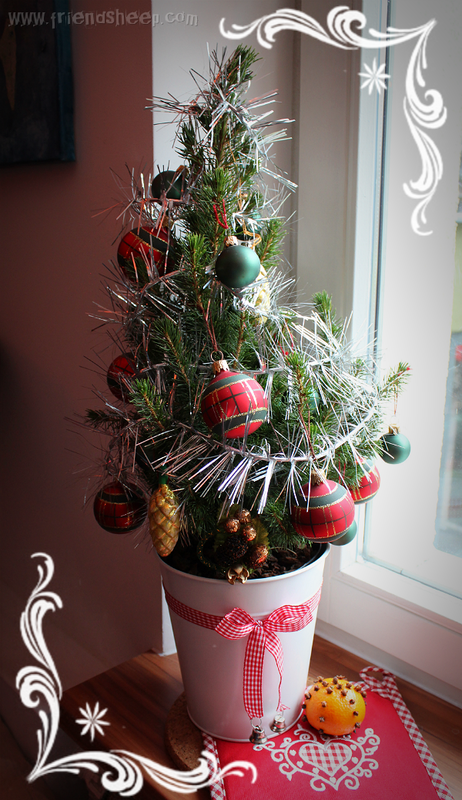 I love your little tree!! I was watching a podcast and it she talked about not wanting to cut down a tree so they bought a little pine tree to let grow in a pot and use as a tree for a couple years and then when it gets to big they will put it in her parents yard. But i really love that idea of just a little special tree. Ours is a fake tree but that is what i have always had growing up. Lane, my husband, they always had real trees and after see theirs again this year i am really starting to think maybe i want on next year. But that i just me talking. Next year i will prob still use my same tree. We have had it over 10 years and it still looks great and there is something special in that too. It was Lane and I's first tree together in our own apartment. Lol there i go babbling like crazy. Your little tree is adorable! i hope you had a wonderful christmas. My computer broke so until i got my new one i have gotten a bit behind.